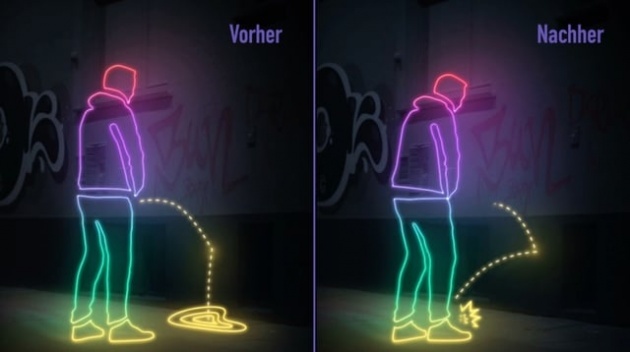 An eye for an eye, a tooth for a tooth – it’s not the principle that most modern justice systems are founded upon, but it's the basic concept behind a new effort by residents of the St. Pauli nightlife district in Hamburg who are combatting public urination with walls that splash back. Community group IG St. Pauli is coating some of the area's most peed-upon walls with a liquid-resistant paint that employs nanotechnology to send bodily fluids right back to the source. Signs posted on some of the spots warn that “St. Pauli pees back.” While the initiative has gained both fans and local media attention, it remains to be seen whether a solution has finally been found to the age-old problem of public urination.